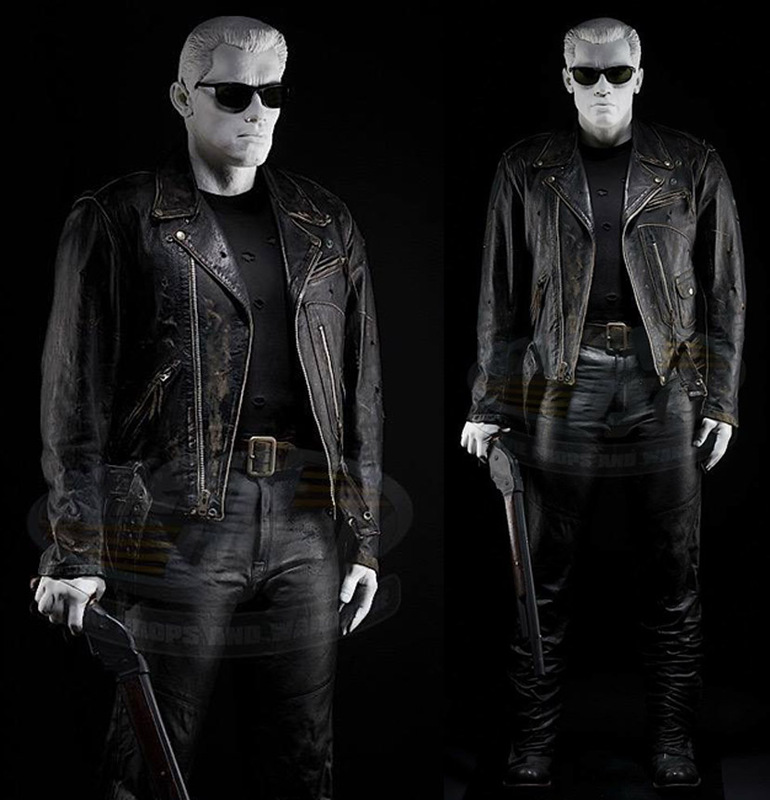 A pair of custom life sized museum figures of Arnold Schwarzenegger to display his Terminator 2 costume and motorcycle. 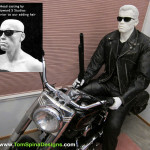 One of our clients contacted us to help them display Arnold Schwarzenegger’s Terminator 2 costume and motorcycle. 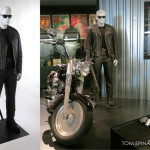 They wanted to create a dynamic display with Schwarzenegger riding his original motorcycle in his original film wardrobe. 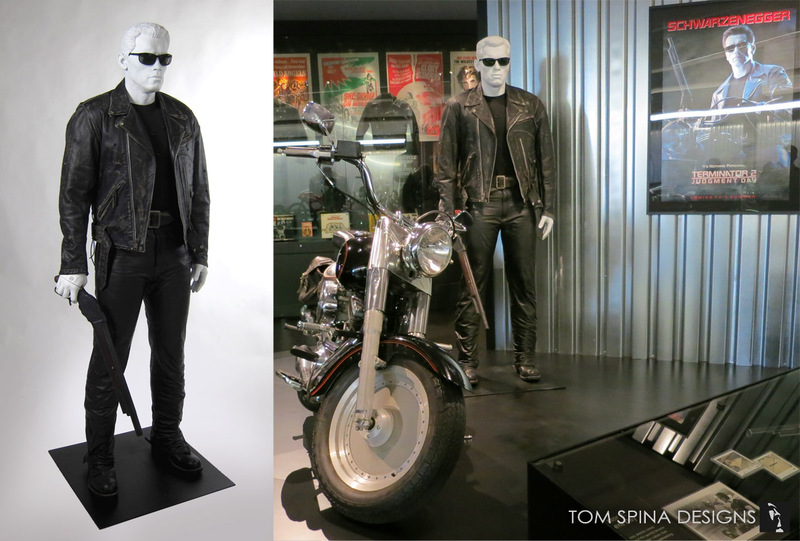 Ultimately, both the costume and bike went on display at the Harley Davidson Museum and at that time, we created a new life sized standing statue for the costume. 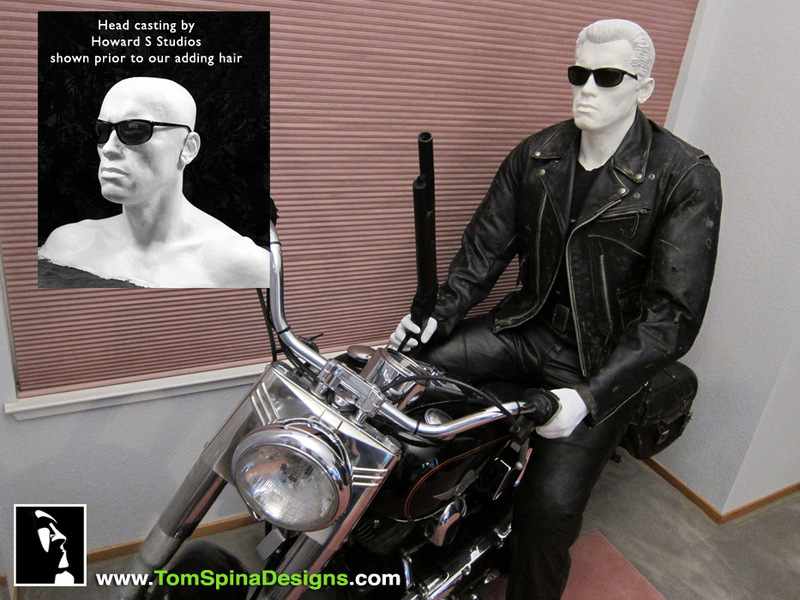 For the motorcyle-riding Terminator statue, our client had a poseable mannequin for the piece but he wanted a custom head and set of hands which would fit around the gun’s handle and the motorcycle’s handle bar. 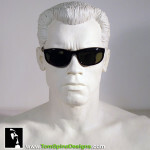 To display the sunglasses and shotgun we had to come up with a few creative solutions. 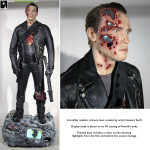 A statue’s hair doesn’t react like an actors! 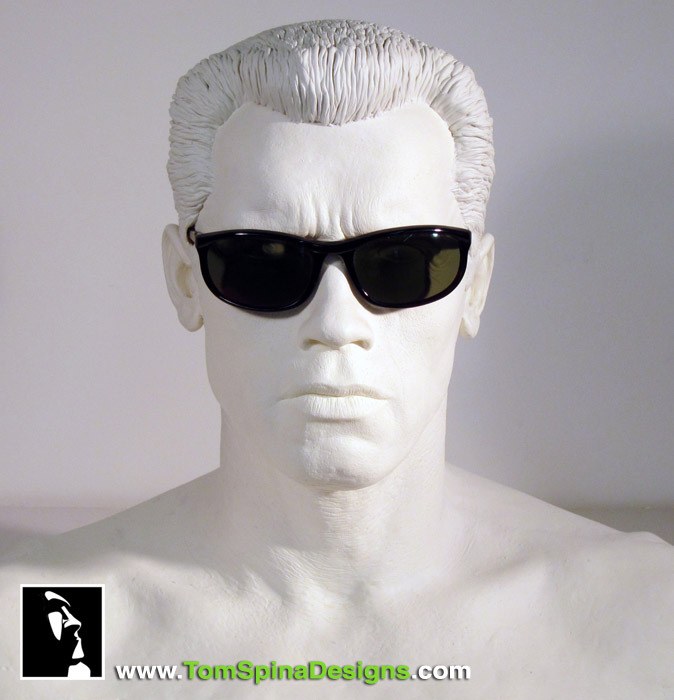 For the sunglasses we added two channels to the hair we sculpted over a modified lifecast so that the sunglasses would slide inside the head and rest in a more natural position. 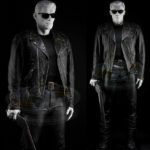 The shotgun required a custom hand to hold it. 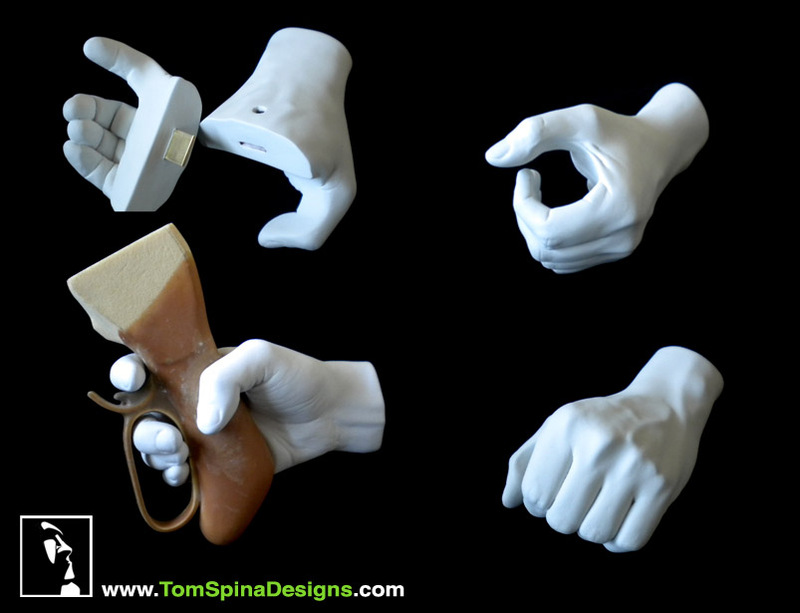 Working with lifecasts, the hand sculpture was then cut into two pieces which would fit around the trigger and handle of the gun. The two pieces would then screw together to hold the gun handle in place. A few years after we created the original pieces for our client, they lent their costume and motorcycle to the Harley Davidson Museum in Milwaukee, and reached out to us to create an updated display for the Arnold costume where Schwarzenegger was standing so the public could get a better look at the costume from head to toe… as well as a clean look at that motorcycle. 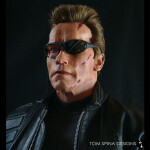 To display the costume we had to create a customized mannequin which would match Schwarzenegger’s large and muscular build. 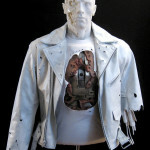 Retail store mannequins generally don’t have a 45 or 50 inch chest! 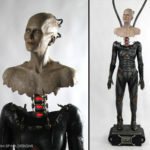 Our custom statue let the costume drape naturally and kept the figure looking appropriately proportioned. 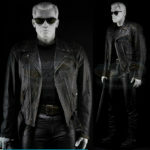 This was done using the costume’s measurements to reverse engineer the mannequin to the proper, Terminator T-800 size. 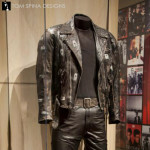 The final result is a great, neutral mannequin that lets this screen used movie costume be the showcase of the exhibit! Some folks say this was the best film of the series. Download and watch it again to find out for yourself!